Rice has been grown in Taiwan for a long, long time. While the earliest written record of rice being cultivated on the subtropical island dates back to 1602, archaeologists have found evidence that aboriginal peoples collected wild varieties as early as 5,000 B.C. Today, however, Taiwan's rice producers are feeling more than a little anxious about their prospects. Per capita rice consumption has plunged from 132 kilograms to just 45 kg in the last 40 years, as rising affluence has led to an increase in the consumption of imported staples such as wheat, along with meat and other animal-based proteins. Concerns have been muted until recently. But with Taiwan now showing a 10 to 15 percent surplus in supply, officials in government, industry and researchers are looking for ways to reverse the trend. This is not the first time that Taiwan's rice growers have faced problems, of course. When Chinese immigrants came to the island in the 16th century, they brought a long-grain species of rice called indica that easily adapted to the new location, which was much like its native habitat in South and Southeast Asia. However, when the Japanese arrived in 1895, they brought a different variety called japonica, which is short-grained and starchy, the kind of rice widely consumed in Japan, Korea, and northern China. Their intention back then was to grow rice for their home market as part of an official policy meant to offset a decrease of rice production due to industrialization and price hikes resulting from Japan's war with Russia. Unfortunately, japonica did not respond well to Taiwan's subtropical climate and long hours of sunlight. Crop after crop of japonica failed, as did efforts to develop indica varieties acceptable to Japanese consumers. However, after 25 years of frustration, two discoveries were made that resolved the problem, while altering the Taiwanese diet forever. The first occurred in 1921 when it was found that a variety of japonica from Japan's southern main island of Kyushu could be grown near Bamboo Lake in the mountains north of Taipei. This led to the growing of other Japanese cultivars at higher altitudes, although efforts to move these to flat lowlands favorable to production farming in Taiwan continued to fail. Then in 1923, a Japanese rice breeder named Megumu Suenaga discovered a new cropping scheme for growing a japonica variety at a lower altitude. Suenaga, who later headed a rice experiment laboratory in central Taiwan now called the Taichung District Agricultural Research and Extension Station, found that Nakamura rice reached the highest yield potential if seedlings were transplanted from their seedbeds into the flooded fields earlier than native varieties and at a shallower depth. In 1925, Japanese administrators abandoned the indica breeding program and doubled down on japonica, adopting the name Ponlai for Nakamura rice grown in Taiwan a year later. Suenaga's supervisor, Eikichi Iso, also played an important role in developing new strains of japonica in Taiwan. Iso published an article in 1928 that led to the successful breeding of a new Ponlai variety that became the parent of a major staple of the Taiwanese diet. Crossing the japonica varieties of Kameji and Sinliki, the new hybrid, Taichung No. 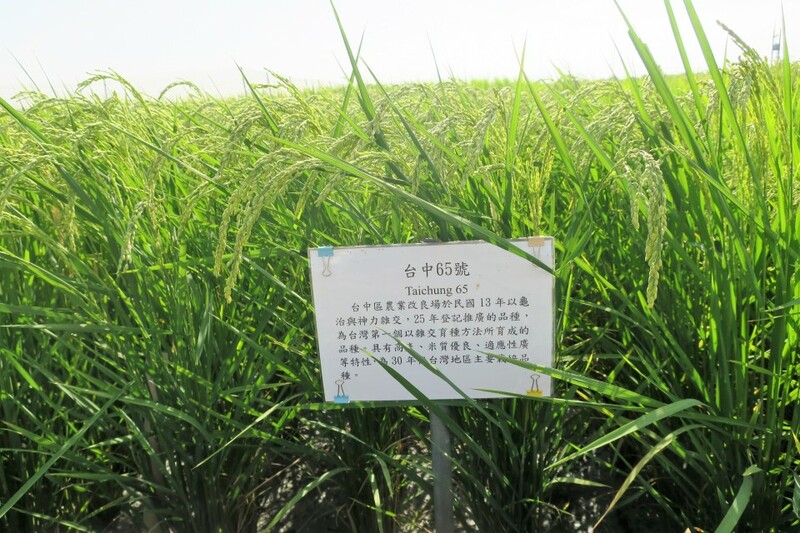 65, combined the characteristics needed to grow rice in Taiwan for the Japanese market: short round grains, sticky texture, high production yields and the ability to withstand local pests, heat and sunlight. Since 1929, researchers at the Taichung Station have planted and harvested Taichung No. 65 as a recurrent parent for the station's ongoing rice breeding program. To commemorate his contribution to Taiwan, the station has a bronze statue of Suenaga, who is fondly remembered as "the mother of Taiwanese japonica rice." For his part, Iso has been dubbed the "father," and his laboratory, a row of wooden Japanese-style bungalows at Taihoku Imperial University, the predecessor of today's National Taiwan University, was designated a historic site by Taipei City in 2009. "Without Japanese rice breeders, the rise we grow today in Taiwan would not exist," said Lin Hsueh-shih, head of the Taichung district research station. Putting it more bluntly, Chen Jen-ping, director general of Taiwan's Agriculture and Food Agency, said, "The DNA of Taiwanese rice originated in Japan." Taiwan's experiment stations continue to breed new strains of rice. While the focuses remain on japonica, some growers continue to grow indica, mainly for the use in processed foods. The most recent indica rice variety is Taichung No. 197, which was bred specifically for products such as rice noodles, rice cakes and various products used in baking. Apart from the decades it took to grow japonica in Taiwan, other problems have challenged researchers over the years, and these will continue to arise, especially in areas such as drought and pest control as climate change begins to effect island agriculture. However, nothing like the current problem has ever presented itself, and breeders are once again being called upon to meet the needs of government and industry as they seek solutions to dietary change. As it happens, Taiwan is not alone in dealing with waning rice consumption. Affluence has also affected other countries in a similar way in the region, such as Japan, where recent figures show that per capita annual consumption is now 54.4 kg, less than half the amount consumed 50 years ago. Similarly, South Korean per capita rice consumption dropped to a record low last year, more than a 50 percent drop since 1970. Unlike South Korea, Taiwan has not reduced the amount of land allocated to growing rice. Nor does it encourage farmers to grow more rice to feed livestock, as in Japan. Instead, Taiwanese farmers have been encouraged to sustain production, while researchers in government and industry seek a solution to oversupply by way of marketing and development. In addition to new product lines, the Agriculture and Food Agency established an online platform in April that allows consumers to purchase rice-based foods. Apart from the domestic market, the agency is eyeing the more than 10 million foreigners who visit Taiwan annually, especially those who come from japonica-growing countries like Japan.